We’d love your help. 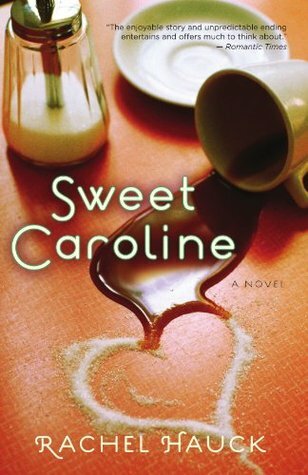 Let us know what’s wrong with this preview of Sweet Caroline by Rachel Hauck. She's sacrifice her desires for others--unlike her mother who abandoned their family years ago. But when a friend challenges her to accept an exciting job adve Caroline serves others with little time to enjoy the sweeter parts of life. Until her old boyfriend returns to town--and she's given a second chance at first love. To ask other readers questions about Sweet Caroline, please sign up. I enjoyed this book and enjoy Rachel Hauck's writing, however....I want to know how Caroline and Mitch end? I have already read Love Starts with Elle and I can't remember if she mentions Mitch and Caroline....Do they end up together? I wasn't sure what to expect with this story. At first I thought it would be a straight chick lit, and in some ways it was. However, Sweet Caroline touched me in a deeper place than most lits do. I actually got choked up a few times. I rarely do these days. There were some very funny moments, some truly enjoyable girl times, and some romantic interludes that sizzled and popped. Best of all, though, was a spiritual awakening and a discovery of one's place in this world that was breathtaking and y I wasn't sure what to expect with this story. At first I thought it would be a straight chick lit, and in some ways it was. However, Sweet Caroline touched me in a deeper place than most lits do. I actually got choked up a few times. I rarely do these days. There were some very funny moments, some truly enjoyable girl times, and some romantic interludes that sizzled and popped. Best of all, though, was a spiritual awakening and a discovery of one's place in this world that was breathtaking and yes, sweet. I loved this story. It was hard to put down once I got past the first few chapters. I loved the old folks, the lowcountry charm, and the author's voice. The honesty and self-examination Caroline had to deal with in order to grow was truly inspirational. She was strong, yet totally emotionally vulnerable, and for good reason. I loved how Caroline was so perceptive of other people's needs. She was also brave and willing to tackle her issues. When she helped her brother tackle his bitterness there was a genuine God moment that was unforgettable. I am rarely as moved as I was during that pivotal point in the story. Of course I'm being vague so as not to spoil the surprise. At any rate, this story is probably my favorite story penned by Hauck. Does it get any better than this??? Seriously. I thought this book was really sweet and lovable. I really didn't think it would end the way it did, which was okay, but I can see the author continuing Caroline's story. I read the ebook. The breaks in time weren't really clear within the chapters, and I think that messed with the flow and enjoyment of the book for me. I did really like the characters. Something was lost in translation between print and ebook with this. Words were hyphenated in the middle of lines and scenes changes without warning. I was reading words like managed as man-aged and they didn't make sense. Also one minute Caroline and Mitch would be walking together and all of a sudden Caroline would be climbing her tree to think. What! Where did that come from! As for the story itself, Caroline was too indecisive for me and the religious part felt really forced at first. I did l Something was lost in translation between print and ebook with this. Words were hyphenated in the middle of lines and scenes changes without warning. I was reading words like managed as man-aged and they didn't make sense. Also one minute Caroline and Mitch would be walking together and all of a sudden Caroline would be climbing her tree to think. What! Where did that come from! As for the story itself, Caroline was too indecisive for me and the religious part felt really forced at first. I did like Mitch but I kept forgetting who Kirk was and I still don't know who Luke was. I didn't like the ending either. Imagery was really good and the meals sounded good. Very slow start for me...picked up a little in the middle-end. I don't know if it the kindle version (probably), but it was very confusing at times. We would be in one place with characters talking, then all of the sudden in the next joining paragraph we are in a totally different situation... The Christian aspects were a little too preachy. Romance was a little weak, didn't give a good happy concluding ending, don't know if this is going to be a sequel or not...just ok for me. This book was a good distraction for me when I needed a fast, easy read. Caroline is a people pleaser who can't say no to anyone, and always puts off her own plans and dreams for others. Now she's been offered the opportunity of a lifetime, a job in Barcelona with one of her best friends. The only problem is: she's just inherited the Cafe she used to work for, and her long time love is back in town. Will Caroline finally put herself first? And what does that mean exactly? Cute at times, but just to over the top for me. The main character has to choose between two completely hot guys who are after her (one a famous country star). Also whether she should take a job with the Donald Trump of Europe who thinks she's wonderful, despite the fact that she has no experience, education, foreign travel background, connections or even lived out on her own, or stay and own her own business that she received for free and starts doing great under her Midas touch. Even though this is categorized as a romance, I didn't see it as one. To me, it was a story of a woman facing some difficult choices. The ending was not what I was expecting, but it was believable and left several possibilities open for what could happen next. The story is told with a single POV and it is told in present tense. I liked that! It's different! Started out okay and then went downhill slowly but gradually all the the way to an unsatisfying end. I liked the book. Great characters and I love that is has a South Carolina feel. I was disappointed in the end though. It left you you hanging and I didn't like it. Fantastic!!! funny love story and friendship too. And let's not forget car naming. Great Novel I love her!! Perfect mix of something totally more than sweet. I loved the characters and everything. What an amazing, wonderful book! I cried and laughed ( the racing scene was hysterical to me lol) I can't wait to read book #2! First off, I wished I would have read this one first. I read the second one in this series last year so now I am so eager to reread it just because the ending in this one felt like it was not totally finished yet. That being said, I felt like Caroline was a character that was very relatable and likable. Her need to help out everyone but herself seemed like a weakness sometimes, but overall you cannot really find fault with someone that is that charitable and kind. I felt the storyline taking me First off, I wished I would have read this one first. I read the second one in this series last year so now I am so eager to reread it just because the ending in this one felt like it was not totally finished yet. That being said, I felt like Caroline was a character that was very relatable and likable. Her need to help out everyone but herself seemed like a weakness sometimes, but overall you cannot really find fault with someone that is that charitable and kind. I felt the storyline taking me through different curbs. In the beginning, it was the mystery with her getting his boss' business. Then there was the fact that the two men in her life "seemed" to be good guys but then later one one proved to be the better catch than the other. Then you have the fact that Caroline had the job offer in Barcelona. Is she going to take it or not? The author wrote it in a way where at times I thought she would let it go and then there were times when I knew she would go for it. This review has been hidden because it contains spoilers. To view it, click here. I'm SO torn over this one! Really enjoyed it almost all the way through but hated how it ended. I'm a big fan of "guy-always-gets-girl" and "everybody lives happily ever after." Although, I do understand where the Author was taking it and I still enjoyed the storyline. Rachel Hauck is extremely talented and totally made me feel like I was right there with the main character. I'm excited to read the 2nd book in the series. I do enjoyed this book. Identifying with codependent tendencies, I enjoyed her bravery in stepping out in faith! I completely laughed out loud in the middle of the night reading chapter 19! I did enjoy reading this book. Caroline has such a big heart to help those that really have a need. She is a great example for anyone. While we as individuals need to take care of ourselves we can do that better if we keep being kind in this world. Our needs will be taken care of. A fun story about a woman living in a small town. The people she knows and the humdrum way of life. A bit of comedy and humor mixed in. The book overall was ok and would only appeal to very specific readers: those how enjoy romance and humor. This was an enjoyable story but I was disappointed with the ending until I realized it is the first in a series. Light and easy reading. A wonderful story of love and giving and finding God's will for your life. Highly recommended. This book made me laugh out loud! Wanted a different ending. Hopefully that happens in the next book of the series. May be one of my new favorite writers when looking for something not too heavy. I enjoyed the book. It had a great story line that included the strength of the main character and romance. Probably would give this a 3.5! A sweet little book!